Hours have been spent crafting this exclusive new disk from Carillon Studios. 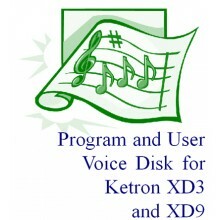 Packed with 120 new Program sounds and 120 new User sounds the disk increases the power of the XD3, XD9, SD3 and SD5 considerably. Feature sounds we believe users will be particularly impressed with include New Theatre and Drawbar organs, Shadows type guitars, Sax's, Piano's and some very cool pad sounds designed by Dave Medcalf and some great new accordion sounds from John Romero. Hours have been spent crafting this exclusive new disk from Carillon Studios. Packed with 120 new..